CHANHASSEN, Minn., March 17, 2017 /PRNewswire/ — At a time when children of all ages should be celebrating every day of their young lives, the reality is thousands of children nationwide face the uncertain diagnosis of cancer, as well as sky rocketing youth obesity rates making the life expectancy for kids less than those of today’s adults. 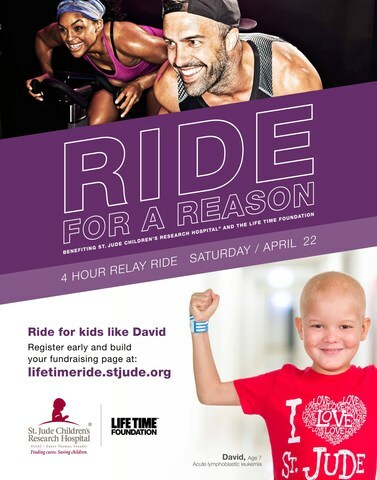 In an effort to identify a cure for childhood cancer and improve children’s nutrition, more than 100 Life Time destinations across the country are hosting the second annual Ride for a Reason event to benefit St. Jude Children’s Research Hospital and the Life Time Foundation on Saturday, April 22. Open to both members and non-members of Life Time, and avid cyclists to first-timers, proceeds raised from this one day, four-hour indoor cycling event will benefit St. Jude and Life Time Foundation. St. Jude Children’s Research Hospital is leading the way the world understands, treats and defeats childhood cancer and other life-threatening diseases. Treatments invented at St. Jude have helped push the overall childhood cancer survival rate from 20 percent to more than 80 percent since it opened its doors more than 50 years ago. The Life Time Foundation is a public charity committed to improving children’s nutrition by improving school meals. “Ride for a Reason” is a one-day event that will consist of a four-hour indoor cycling ride with teams of up to four riding in alternation on an assigned indoor cycle bike. Each team will be given their own fundraising website after registering for the event that consists of tools to help measure progress, increase fundraising, coaching emails and personalized fundraising pages to motivate donors. The Life Time Foundation is committed to improving children’s nutrition through education and the elimination of highly processed and unnatural ingredients from school menus. St. Jude has treated children from all 50 states. The Life Time Foundation is currently working with more than 300 schools nationwide. Register to Ride – Registration is open through April 15, 2017 and participants can register at an event near them at www.lifetimeride.stjude.org. Learn More – Contact your local Life Time or visit www.lifetimeride.stjude.org for more information on a “Ride for a Reason” happening near you. St. Jude Children’s Research Hospital is leading the way the world understands, treats and defeats childhood cancer and other life-threatening diseases. Everything we do is centered on our mission: Finding cures. Saving children. And families never receive a bill from St. Jude. We pay for treatment, travel, housing, and food – because all a family should worry about is helping their child live. By sharing our knowledge freely and exchanging ideas openly, we’re inspiring more collaboration between doctors and researchers worldwide, and, as a result, more lifesaving treatments for children everywhere. Treatments invented at St. Jude have helped push the overall childhood cancer survival rate from 20 percent to 80 percent since it opened more than 50 years ago. We are working to drive the overall survival rate of childhood cancer to 90 percent, and we won’t stop until no child dies from cancer. Because most of our funding comes from individual supporters, we have the freedom to focus on what matters most – saving kids regardless of their financial situation. At St. Jude, we won’t give up. We do everything possible to end childhood cancer and other life-threatening diseases. Join the St. Jude mission by visiting www.stjude.org, liking St. Jude on Facebook (www.facebook.com/stjude) and following us on Twitter (@stjude). As a public charity created by Life TimeSM – The Healthy Way of Life Company, the Life Time Foundation’s mission is to help schools eliminate seven harmful ingredients from the food they serve so every child can receive the healthy food they deserve. The Life Time Foundation is focused on improving children’s nutrition through education and the elimination of highly processed and artificial ingredients from school menus, ensuring every child has a healthy start in life. Unlike many other charitable organizations in which a portion of donations is consumed by administrative costs, 100 percent of every dollar donated to the Life Time Foundation directly supports its mission because all administrative costs are contributed by Life Time. For more information, visit www.ltffoundation.org. Life Time is a privately held, comprehensive healthy living, healthy aging and healthy entertainment Lifestyle Company that offers a personalized and scientific approach to long-term health and wellness. Through its portfolio of distinctive resort-like destinations, athletic events and corporate health services, the Healthy Way of Life Company helps members achieve their goals everyday with the support of a team of dedicated professionals and an array of proprietary health assessments. As of March 2017, the company operates 122 centers in 26 states and 35 major markets under the LIFE TIME FITNESS® and LIFE TIME ATHLETIC® brands in the United States and Canada. Additional information is available at www.lifetimefitness.com. Next Next post: IHRSA 2017 – Best IHRSA Ever!